The Transvaal And The Tiger – 1907. There was no doubt about the intentions of the Transvaal Government in framing the Immigration Restriction Act of 1907. It was designed to maintain white supremacy in South Africa. Gandhi called it a barbarous act of a Government that dared to call itself Christian. If Christ came to Johnnesburg and Pretoria and examined the hearts of Gen Botha, Gen Smuts and those who held similar views, Gandhi thought he would notice something quite strange to the Christian spirit. 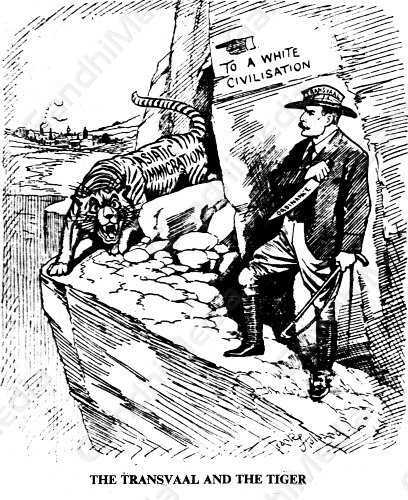 The cartoon depicts Asiatic immigration' as a tiger blocking the road "to a white civilization."